While the AGMA Powder Metallurgy gear committee has referenced 48 pitch as a working limit for fine pitch powder metal gears, production processes are now routinely being used to produce ultra fine pitch P/M gears with a pitch as fine as 96 DP. 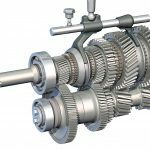 These gears would be difficult at best, in a steel alloy, but recent developments have allowed the production of such ultra fine pitch gears in 304 stainless steel. 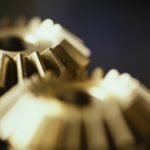 Critical features of these gears and the associated processes are discussed, including powder selection, compaction practices and sintering requirements. The quality of these products will be examined using: (1) data prepared from composite gear records; (2) dimensional SPC records, and; (3) metallurgical evaluation of the gear tooth structure. 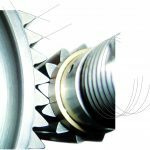 These ultra fine pitch, precision gears find application in medical, aircraft, and industrial markets where accuracy, high speed, quiet operation, and cost efficiency are the key factors in a successful product. Powder metallurgy is a very cost effective process for gear production, providing complex, multi-level, net shaped components. This manufacturing method uses both raw materials and processing resources quite efficiently. 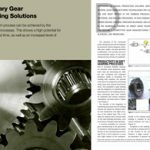 Gears with a very fine pitch, typically with a diametral pitch (DP) greater than 48 as defined by the AGMA Specification for Powder Metallurgy Gears , pose unique challenges to the P/M parts manufacturer. 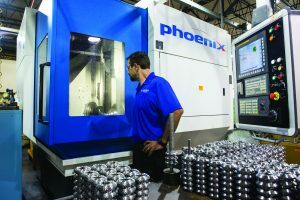 These include die fill, ejection force, tooth integrity, tooling considerations, and part handling issues. Furthermore, fine pitch gears manufactured with stainless steel powder pose additional challenges given the higher compaction pressures and lower green strength as compared to iron or steel powders. Allied Sinterings, Inc., consistently manufactures small stainless steel gears with diametral pitch approaching 120 and AGMA quality class usually exceeding Q7. The key to a successful fine pitch P/M gear lies in a well defined and controlled manufacturing process. 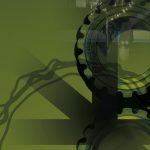 Each critical step is described in the following sections and contrasted to the similar steps for coarse pitch gearing or gears produced using iron/steel powders. 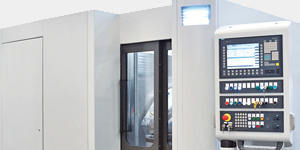 Following accepted design practices for P/M tools subjected to very high compaction forces, the tooling consists of carbide dies and tool steel punches and core rods, typically A2 tool steel. Since many of the designs include extremely thin walls between the root diameter and the inside diameter of the gear (as small 0.020 inch), alternate tool steels such as CPM 3V are considered. 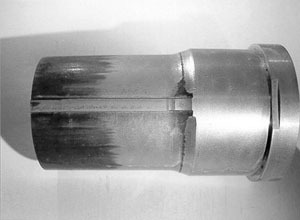 Carbide core rods are avoided due to their fragility. 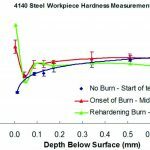 Heat treat practices for the tool steels follow the guidelines provided by the steel suppliers by trying to provide the best combination of high strength and toughness and sacrificing wear resistance, if necessary. Extremely fine surface finishes are the key to a successful tool set: 4 microinch (0.1 micron) RMS maximum for the die surfaces and 12 microinch (0.3 micron) RMS maximum for the working surfaces of the punches. 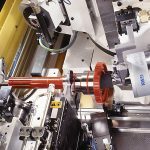 As the tools run in production there is a trade-off between excessive tool maintenance and maintaining these surface finish requirements on the tools. Fit between tool members is typically 0.0003-0.0004 inch (7.5-10 micron) per side clearance, dictated by the fineness of the stainless steel powders, the desire to keep burrs to a minimum, and the quality requirements of the product (composite error). 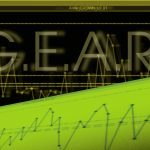 For gear designs that require a hub or compound gears (also known as cluster gears, consisting of a plate gear and a pinion gear) the tools design employs two lower punches rather than a shelf die. 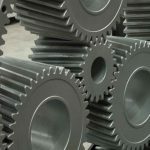 The use of a lower inner and outer punch assures proper powder fill and controlled density in each section of the gear. Adding an angle from the root of the tooth to the gear outside diameter on the face of the upper punch helps increase tooth density and decrease interfering burrs. 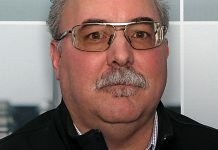 Special tool coatings (PVD or CVD, for example) are now under development to reduce galling and increase tool life. 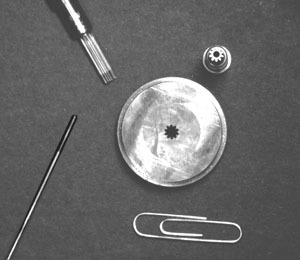 An example of a typical tool set is shown in Figure 1, illustrating the die, upper and lower punches, and the core rod. 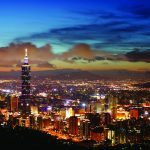 Evaluation of stainless steel powders from several sources has revealed that the source of the powder is not the issue. 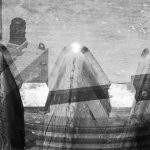 All three major suppliers in the United States produce their powders by water atomization and have good control of their processes. The key powder factor is particle size distribution. The amount and range of powder particle sizes affects many green characteristics–powder flow rate, apparent density, green strength, and the ability to completely fill the die cavity and small tooth openings. Many of these issues are unique to fine pitch gears, as compared to coarse pitch gears, and are especially difficult with stainless steel powders. Typical stainless steel powders are delivered with 40-50 percent fines (-325 mesh or less than 44 micron size particles) as compared to about 20 percent for iron/steel powders. These fine particles reduce flow rate and decrease green strength. 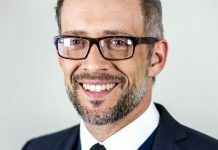 As a result, tailored particle size distributions have been developed to best serve the needs of specific applications. 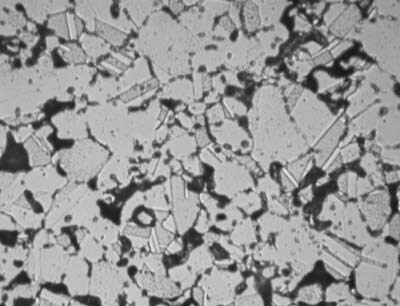 One specific particle size distribution, altered by screening, is used in applications where thin wall sections are not an issue. This altered powder has a 30-percent higher green strength than the baseline stainless steel powder. Each particle size distribution must consider the trade-off between powder flow characteristics, ability to fill the die cavity, and green strength. Another issue affected by the fine pitch gear tooth form and the use of stainless steel powder is high ejection forces and possible galling of the tools. The 304 grade stainless steel is admixed with 0.75 percent Acrawax C and has performed adequately with the altered powder. 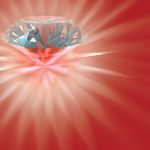 Galling will be aggravated by excessive tool clearances and the presence of excessive fines. This is just another reason to carefully control the amount of the fines in the powder. An example of an internal gear lower punch with galling on the outer surface is illustrated in Figure 2. All fine pitch gears are compacted on Dorst TPA model presses. The advantage of this press design is rigid, tightly aligned tool members in a removable die set. This allows for quick change over and improved productivity and throughput. Press speed is closely controlled to allow adequate time for the powder to completely fill the very small tooth geometries in the die cavity. 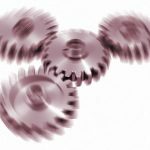 Press speed is also a function of press size (smaller presses typically run faster) and tool complexity (single level parts will typically run faster than multi-level parts). Speeds of up to 40 strokes per minute are possible for these stainless steel gears. Part handling is another key factor in a successful fine pitch gear product. Extra care must be taken as compared to more coarse pitch gear forms. 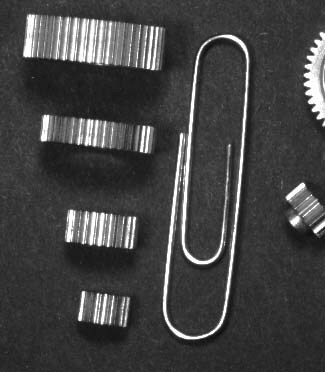 For the smaller gears, approximately 0.5 inch (12.7 mm) or less in diameter, the parts are allowed to fall from the die table to a gravity ramp, and directly into a stainless steel wire mesh sintering tray. 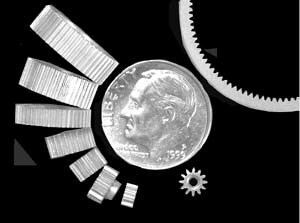 As many as 1,000 small gears per tray is not unusual (see Figure 3). Larger diameter gears are manually transferred from a rotary accumulating table to these mesh sintering trays. 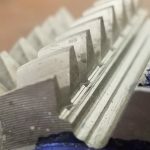 Any parts that are removed from the system for in-process inspection and gear checking are discarded to prevent potentially damaged gear teeth from entering the production stream. Press output is closely monitored to prevent the occurrence of chipped teeth. Compacting at the highest possible density (approaching 6.7 g/cm3 in some designs) without damaging the tools will yield higher green strength and the least opportunity for tooth damage. The advantage of using sintering trays as collection devices at the presses eliminates the need for direct handling of the gears prior to sintering. Sintering conditions include the use of a synthetic dissociated ammonia type atmosphere enriched with extra hydrogen. A Sinterite mesh belt sintering furnace operating at 2100ƒF provides very consistent performance even as the pounds/hour loading varies with product mix. The greatest contribution to dimensional size variation comes from the lot-to-lot variation in the powder, rather than the sintering parameters. The amount of size change deviation typically seen with these powders ranges from 0.15 percent to 0.40 percent shrinkage. At the end of the furnace the parts are transferred from the mesh sintering trays to plastic totes. Most fine pitch gears are tumbled to the extent required in order to remove any burrs, both from the inside diameter and, to a lesser extent, from the tooth face. This process must be closely controlled (time, amount of parts and media, type of media) to prevent rolling the burr into the ID and causing a rejection for an undersize inside diameter dimension. A good burr management program, which constantly monitors burr formation at the press, is required to ensure a satisfactory product from tumbling. When extremely tight tolerances are required for ID size the gears may be honed, reamed, or ball sized. 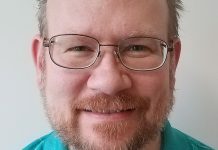 Most designs avoid these costly operations and rely on the process capability to control ID size. A typical tolerance of + 0.0005 inch (+12 microns) for an ID size of 0.1 inch (2.5 mm) is maintained through sintering. These secondary operations for controlling ID tolerances are more typical of larger, coarse pitch gears. 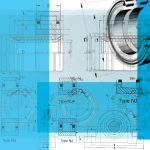 When considering a new fine pitch gear design, the product engineer must be aware of the key characteristics of these powder metal products. Both the dimensional and mechanical/metallurgical features of these gears are described in the following sections. The dimensional characteristics of these fine pitch gears satisfy the basic AGMA gear tolerances of AGMA quality level Q7 and Q8 . 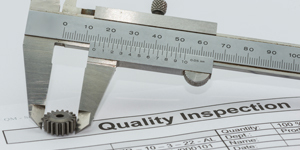 In certain products a quality level Q9 may be feasible. Table 1 below summarizes the critical gear tolerances for these AGMA quality levels in the fine pitch gear sizes normally produced. Fine pitch gears do not have lead or involute requirements. 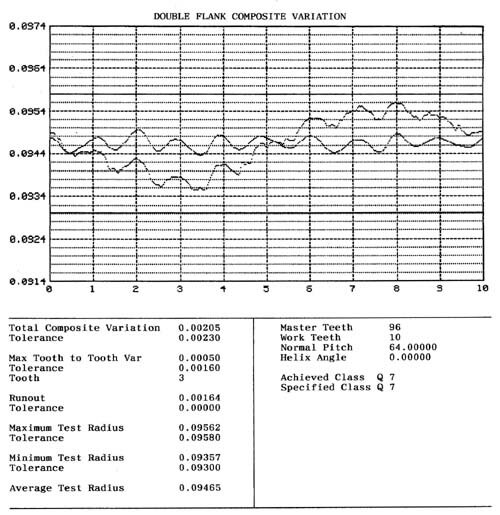 This table clearly shows that as the AGMA quality level increases the allowance for both total composite error and tooth-tooth error decrease. In addition, as the diametral pitch increases (finer tooth sizes) the allowance also decreases. Thus the finer the pitch and higher the quality level the more precise the gear quality. Actual composite variation traces obtained from two typical production gears are illustrated in Figure 4 and Figure 5. Figure 1 illustrates the gear trace for a 48 tooth, 88 diametral pitch sun gear with a 20ƒ pressure angle. The test instrument rolls the test gear against a master gear to detect both the composite and tooth-tooth variation. 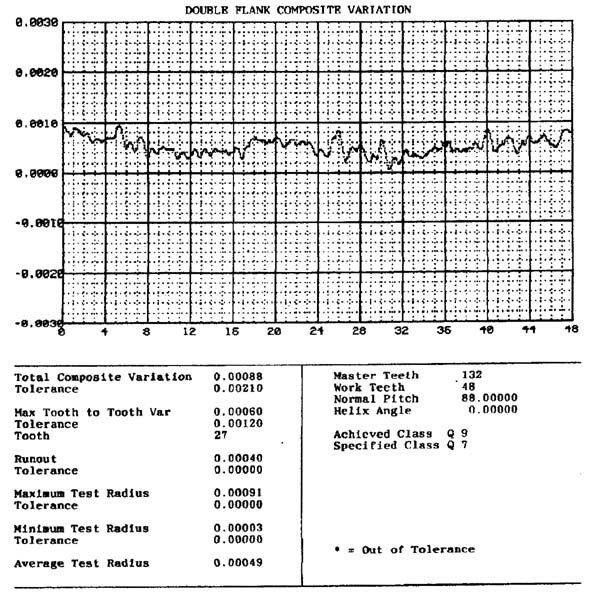 The output data at the bottom of the chart includes both the measured output and the tolerance values for this quality level and gear geometry. Note that the specified quality level (Q7) was exceeded by this test gear and it actually achieved a Q9 level: allowance for TCE was 0.0021 inch (52 micron), while the actual measured TCE was only 0.00088 inch (22 micron); the TTE allowance was 0.0012 inch (30 micron), while the actual test gear had an error of only 0.0006 inch (15 micron). Figure 5. shows a second gear trace for a 10 tooth, 64 pitch gear. The TCE trace shows the complete roll of the gear across the 360ƒ of the diameter. The second trace is just the TTE error portion of the TCE trace laid out on the nominal horizontal axis for ease of measurements (computer generated). 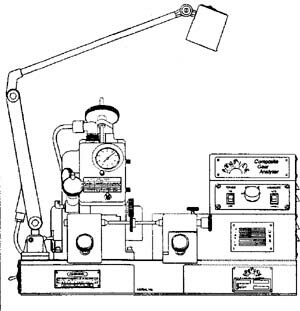 The complete gear checking instrument is shown in the line drawing in Figure 6. Overall dimensional feature tolerances are summarized in Table 2 below. Typical ID tolerances are 0.001 inch (25 microns) for ID sizes ranging from 0.040 inch (1 mm) up to 0.10 inch (2.5 mm). 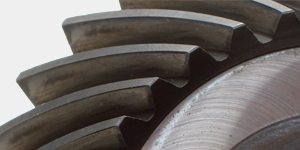 Multi-level gear designs (gear and hub or a compound gear-pinion) can lead to density gradients, resulting in a tapered ID. Outside dimensions are generally held to 0.002-0.003 inch (50-75 microns) depending on the actual size of the gear (smaller diameter gears have tighter tolerances than larger gears). Pressing length dimensions have a 0.005 inch (125 microns) tolerance for lengths up to 0.25 inch (6.25 mm); lengths greater than 0.25 inch (6.25 mm) require 0.008 inch (200 microns) tolerance. 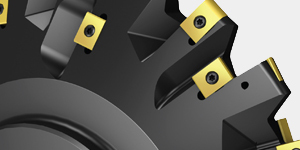 The geometry of the gear teeth in these fine pitch designs typically does not take advantage of the full fillet radius at the root diameter so prevalent in coarse pitch P/M gears. This approach will unnecessarily decrease the wall thickness between the root diameter and the inside diameter. The more conventional root fillet design is used to maximize this wall thickness. In addition, high bending loads on these miniature gear teeth are not typically a critical issue for a successful product design. 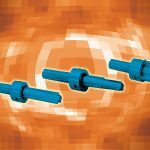 The typical product densities for these fine pitch gears range from 6.7-6.8 g/cm3 except in regions that are sensitive to excess tool pressures and require a more robust design. 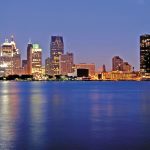 These local regions may have lower densities, typically 6.4 g/cm3. Using MPIF Standard 35  as a guide the typical mechanical properties for this 304 stainless steel grade are listed in Table 3. The quality of the sintering process is demonstrated by the excellent ductility and impact energy for this stainless steel. A typical microstructure is shown in Figure 7. Fine pitch gear designs are typically used in small motors and actuating devices. A 78 pitch, 15 tooth gear-hub design used in a motor-actuator for raising the radio antenna in automobiles is shown in the bottom left of Figure 8. This gear has a 0.060 inch (1.5 mm) inside diameter through hole, gear face width of 0.075 inch (1.88 mm)and an overall part thickness (including the hub) of 0.145 inch (3.6 mm). The pitch diameter for this design is 0.192 inch (4.8 mm). This same customer uses both a 10 and 12 tooth pinion gear design for similar motor devices, shown across the bottom of Figure 8, to the right of the gear-hub part. Another automotive actuator design uses the long pinion shown in Figure 10. 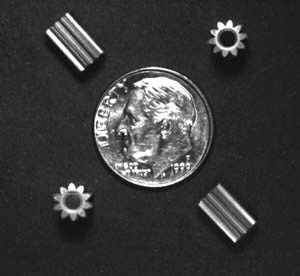 This 10 tooth, 64 DP gear is 0.300 inch (7.5 mm) long with a 0.090 inch (2.3 mm) inside diameter through hole and a 0.160 (4 mm) pitch diameter. Note the very thin wall thickness between the ID and the root diameter for this exceptionally long pinion length. Small planetary gear motors are used to power a variety of industrial devices. The three planet gears and two sun gears shown on edge (Figure 8, top left) as well as the portion of the ring gear (upper right, Figure 8) are examples of these planetary gear train products. 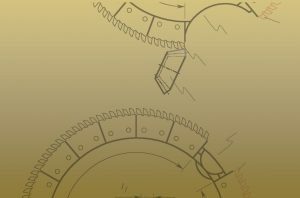 These planet gears are also shown in Figure 9 (left view, shown on edge). Another industrial motor drive gear is shown in Figure 9 (bottom left view). Two gears used on an instant camera film ejection drive system are shown in Figure 11. The larger diameter gear is 48 diametral pitch, 0.25 inch (6.3 mm) pitch diameter, 0.100 inch (2.5 mm) diameter inside diameter and 0.050 inch (1.3 mm) thick. The smaller diameter but thicker gear is a 64 DP design. Control of raw material and processing conditions is key to a successful fine pitch powder metal gear. Stainless steel P/M gears of AGMA Q7 or better with a diametral pitch of up to 120 are feasible using current P/M technology. Numerous industries, including automotive, are successfully using fine pitch stainless steel P/M gears in their product designs. Specification for Powder Metallurgy Gears, ANSI/AGMA 6008-A98, American Gear Manufacturers Association, Alexandria, VA, 1998. Gear Classification and Inspection Handbook, ANSI/AGMA 2000-A88, American Gear Manufacturing Association, Alexandria, VA, 1988. MPIF Standard 35, Materials Standards for P/M Structural Parts ‚ 2000 Edition, MPIF, Princeton, NJ, 2000.